What is a Call Box? 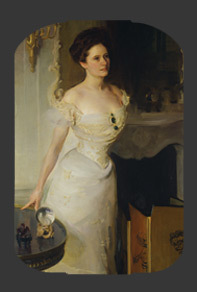 Location: 23rd St., Sheridan Circle, S.
In the Gilded Age (1866-1901) the nouveau riche built grand mansions near Sheridan Circle and commissioned fashionable portraits such as this one of Mrs. Larz Anderson. They lived and entertained in these enormous residences during Washington's brief social season. As maintaining the houses grew too costly, many became foreign embassies. Edward Everett, who made a fortune inventing the fluted bottle cap, built the Beaux-Arts mansion at 1606 23rd St. in 1915. Now it is the Turkish ambassador's home. Carrere and Hastings, architects of the New York Public Library, designed Romania's embassy at 1607 23rd St.